View Cart “ITIL® Foundation Handbook” has been added to your cart. 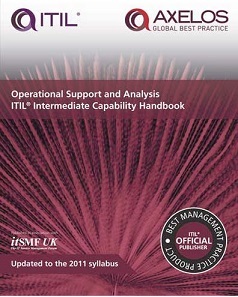 The ITIL® Intermediate Capability Handbook: Operational Support and Analysis provides a handy reference to the content contained within the core ‘ITIL Operational Support and Analysis (OSA)‘ guidance and summarizes its key elements. Updated in line with the ITIL 2011 editions and the Operational Support and Analysis (OSA) syllabus, this quick-reference guide will help you as you study for the OSA module of the ITIL Intermediate Capability qualification. Beyond the exam, this handbook is a practical resource that can be used in the workplace. Companion volumes covering the other Intermediate Capability modules are also available. NOTE: Books are shipped using USPS and typically take 5 to 7 business days to arrive (over seas shipment typically require 3 weeks for delivery). If, after 10 business days (15 for overseas shipments) you have not received your order, please contact us so that we can investigate the cause of the delay and get your shipment to you. Standard shipping to the US is free. International and expedited shipping are available for an additional fee. If you require international or expedited shipping, please contact us for a quote.